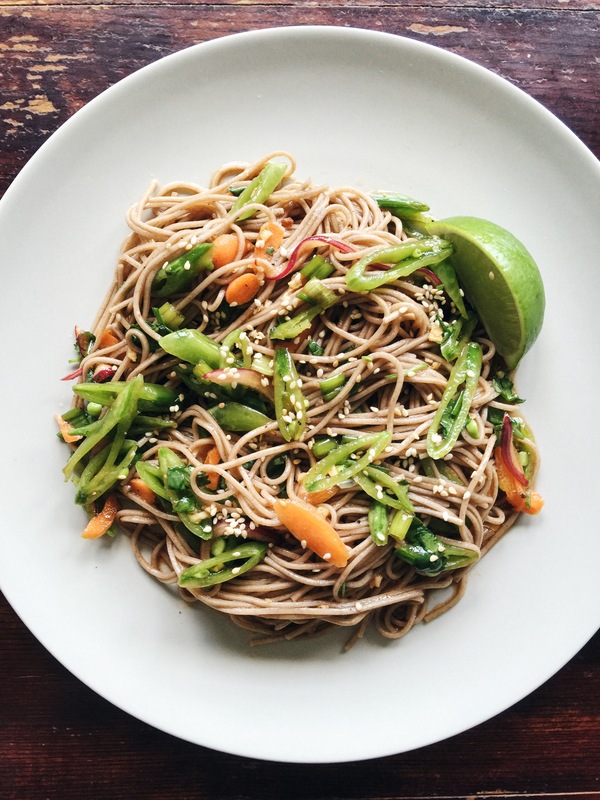 Summer posts have been a bit sparse, but I am back today with a completely delicious soba noodle salad that really delivers on ease and flavor. So easy, in fact, that I threw it together for lunch and my kitchen doesn’t even look that bad after making it. It has a dressing that needs to sit for a few minutes to let the flavors develop, so I’m thinking you can mix up a double batch of the dressing and keep it refrigerated. Then you can toss it together with the cooked noodles and vegetables later in the week when you need a quick lunch or you want to get ahead for dinner prep. If you haven’t tried soba noodles before, now’s the time. 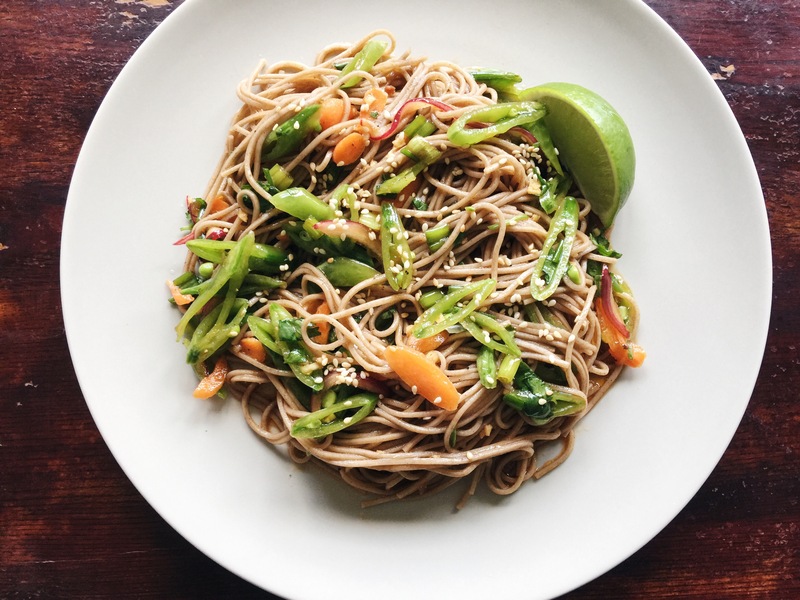 These perfectly chewy noodles pair well with the crunchy vegetables and they really absorb the sauce. For a more substantial dish, this would be absolutely fantastic with some thinly sliced grilled pork or salmon. *Tip: Make the dressing first and let sit while the water boils and the noodles cook. Toasted Sesame Seeds and Lime Wedges, for serving. In a large pot, bring water to a boil. Salt lightly once it’s boiling. Meanwhile, combine all dressing ingredients in a medium bowl and cover. Let sit to develop flavor. Once the water is boiling, add soba noodles to the pot, stirring once to avoid sticking. Boil for about 5 minutes, or until they are just slightly al dente. Drain. Add the warm noodles to the bowl with the dressing, along with the carrots and snap peas. Toss gently to combine and serve, topped with toasted sesame seeds and a squeeze of lime. Devour happily. Looks delish!!!! Glad you are back! Looks delicious! I hope you had a great summer! Thank you! I hope your summer was good as well! Thank you, it was nice!